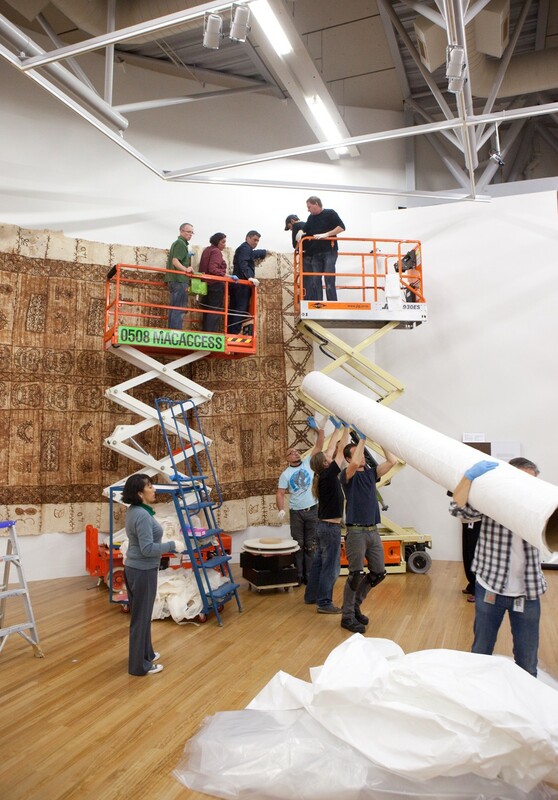 Impressive Tongan tapa – an installation challenge. Paperskin – the art of tapa cloth exhibition is full of many wonderful tapa artworks. 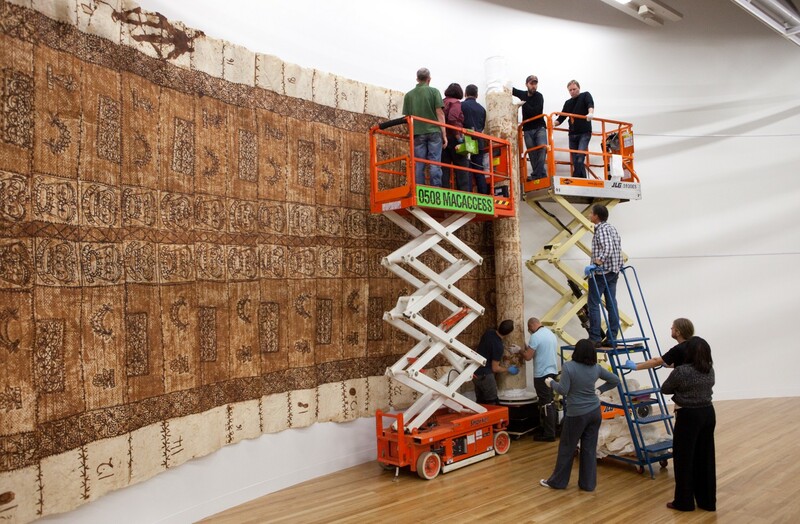 But one Tongan tapa cloth (ngatu) in Te Papa’s collection is amazing because of its size – it is more than 22 metres long and over 4 metres wide. 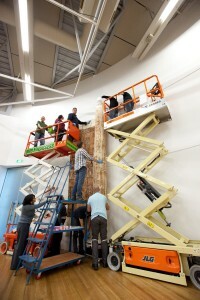 We have never been able to display it rolled out before – we didn’t have a wall big enough, until now…. This impressive tapa was made in 1953 to commemorate Queen Elizabeth II’s visit to Tonga, it was later placed under Queen Salote’s coffin when her body was flown back from New Zealand in 1965. 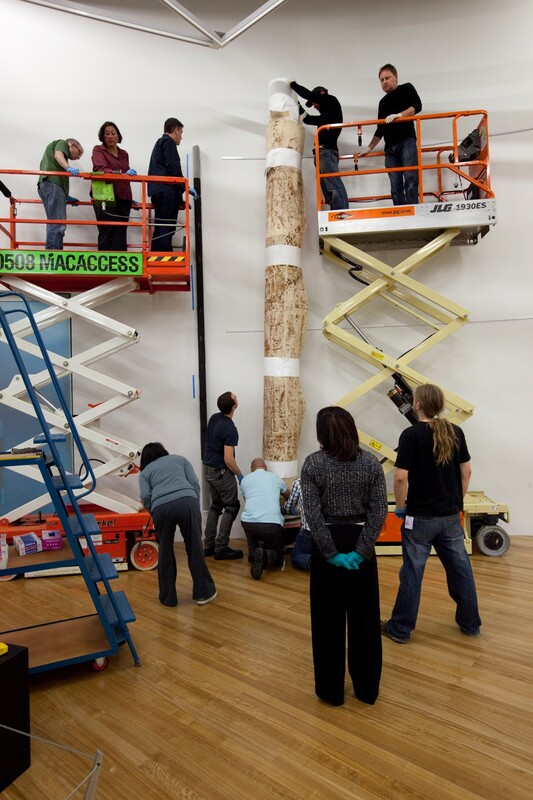 Installing such a large tapa is quite a mission. When it is in storage the tapa is kept carefully rolled up. 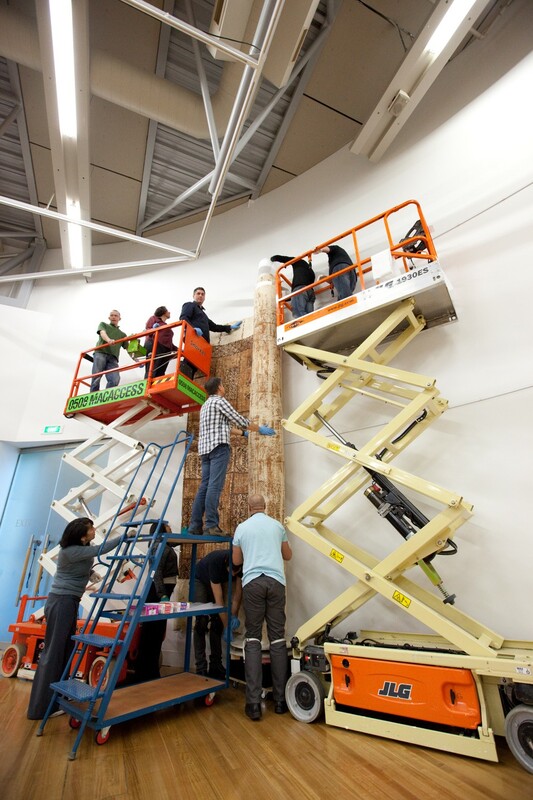 It took a team of 10 staff (exhibition installers, collection managers, conservators and curators) and two fork lifts to get it safely hung on the wall. 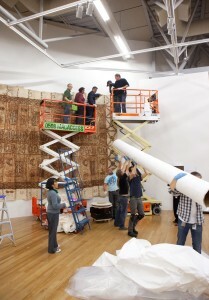 Installation of the 22 metres long Tongan tapa (ngatu) starts. Copyright Te Papa, 2010. Starting to roll out and hang the tapa. Copyright Te Papa, 2010. About a third of the way... Copyright Te Papa, 2010. Almost done... Copyright Te Papa, 2010. All done and the storage roll can be removed. Copyright Te Papa, 2010. Job done - installation of the 22 metre long ngatu is complete. Copyright Te Papa, 2010. 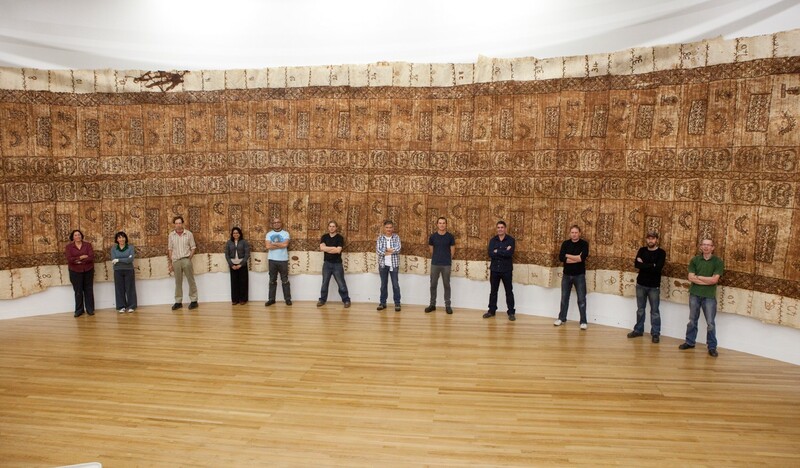 Take this opportunity to view this impressive ngatu – come in and see it for yourself in the Paperskin exhibition. I also have a tapa cloth, It was given to my parents in 1980 by the Tongan queen who visited Rotorua around that time , would it be possible to send a photo of the cloth to get more information about it. It has the words Ko Kaulani, a crown symbol and a bird under three stars. Thanks for your comment and interest. If you’d like to send an email to our Pacific curator Sean Mallon on mail@tepapa.govt.nz he can give you some more information about your tapa. Kind regards, Pamela. 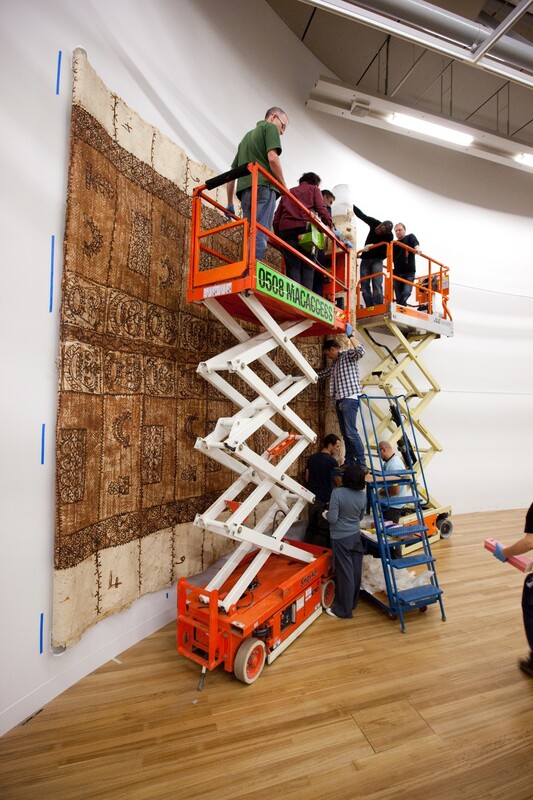 Beautiful way to install & exhibit Tongan tapa! Thank you very much for sharing this interesting information about your tapa from Queen Elizabeth’s visit to Queen Salote in 1953. I’m sure our curator, Sean Mallon, will be very interested to know more about this, and I will ask him to respond to you. I have a tapa from the visit of queen elizabert to queen salote in dec. 19 to 20, 1953, that is 15 feet high by 100 feet long made by 60 tongan ladies. Also photos of the queen’s visit of the ‘royal tour” written and photographed by neil ferrwr of the queens walking on my tapa to the “great feast house” on the tapa which is being held to the ground by the 60 ladies. The tapa was given to me for favors rendered to salote’s family. It is a white tapa with light and dark brown markings pf royal sympols and the date of the visit, among other tongan and british items. My brother-in-law also has a tapa identical to yours on youy web site.